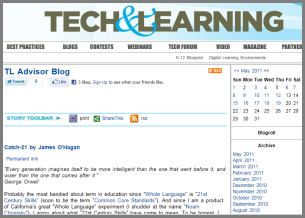 "It has been hijacked by several companies and politicians, and has become a catch-all for educators who feel that because they plug something into a wall during their lessons, or add in some Web 2.0 tool (Glogster, Edmodo, Google Apps, Moodle, to name a few) then that constitutes a 21st Century Skills-based lesson. If you subscribe to the mindset of 21st Century Skills, realize these skills are supposed to mean so much more than just technology, but that is what with which 21st Century Skills have been associated. Not only are 21st Century Skills supposed to cover the core areas (Reading, Writing, Math), but also career, learning and technology skills. What's fascinating is that these skills have been folded into theNETS-S standards and STEM (Science, Technology, Engineering and Math) initiatives. These are the exact same skills that the Eisenhower administration promoted and funded as key to America's future success in the Space Race against the Soviets starting in 1957." 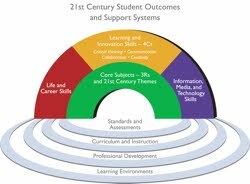 To counter the idea or perceived practice of 21st century skills requiring a quick plug-in to a Web 2.0 tool, we also have participants look at the Partnership for 21st Century Skills web site. This national organization approaches 21st century skills from a more holistic approach and have developed a framework that includes both students skills and support systems needed to teach those skills. My take-away from doing this research and choosing these resources is the importance of keeping the "21st century" label from being just another buzz word in what we do and to be sure to have teachers think beyond the jargon and focus on the students in whatever skills they're trying to teach and to keep a holistic view. Skills, both basic and higher level, may not necessarily change,but the way we teach those skills both in the content and pedagogy we choose, in my opinion, is what should be trans-formative in the 21st century. More on the ADDIE model next . . .